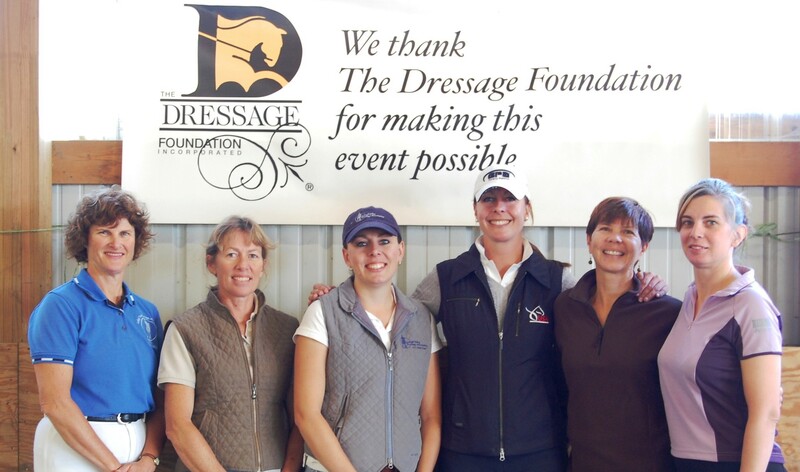 Dressage at Lexington (DAL) 2015 started off with a bang by hosting a new kind of celebration. 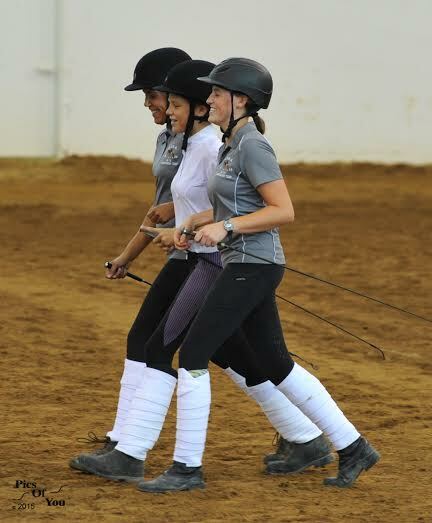 As most are probably aware, The Dressage Foundation supports camaraderie within the dressage community through something called the “Two-Tempi Challenge.” The Challenge is a competition where horses with the ability to complete two-tempi changes, consecutively, compete against each other. DAL 2015, known for hosting new and innovative show features, held its own Two-Tempi Challenge, featuring nine talented horse-rider teams in three divisions. Among this year’s two-tempi masters was Jim Koford and Don Principe, one of the year’s hottest stallions. And although Koford and Marydell Farms’ trusted stallion caught the attention of several hundred spectators, it was ultimately Stratocaster and Lauren Sprieser of Marshall, Virginia who took home the gold with fifty eight consecutive two-tempis. 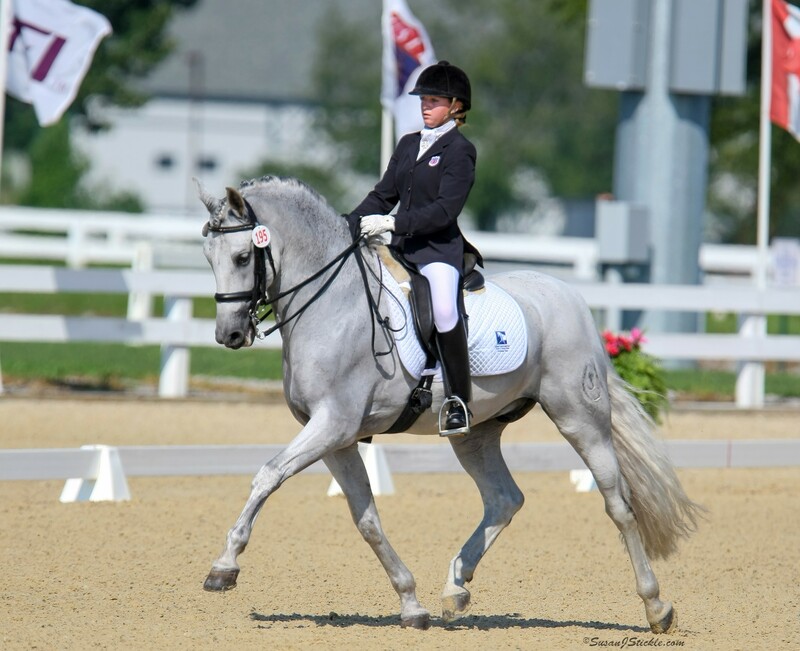 Sprieser and “Fender” weren’t the only showstoppers who participated in the Challenge; Twenty one year old Young Rider Adrienne Alvord and Mondavi F (“Tobi”), completed an impressive forty two consecutive changes. After only working together for seven months, Alvord feels this “special” ten year old Arab/Trekahner gelding, owned by Kathy Rowse and Janice Mumford, “would do anything for her.” Rowse wasn’t surprised with her boy’s success, asserting that, “Tobi would pop twos and ones all day!” Alvord, who trains at Fairview Training Center in Millwood, Virginia, has been competing at DAL since she was twelve years old and will go on to compete at Young Riders in Lexington, Kentucky next week. 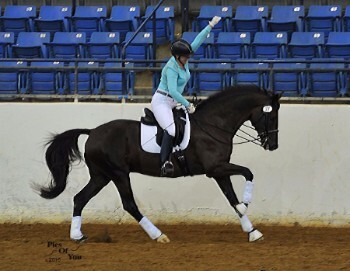 As previously mentioned, the Two-Tempi Challenge is inspired by The Dressage Foundation (TDF), an organization committed to the education of our industry’s riders, trainers, and judges. As such, there was nothing more fitting than to have Rebecca Langwost-Barlow of Preston, Maryland, start off the challenge; she was one of the first beneficiaries of TDF’s scholarship to ride and train in Germany. 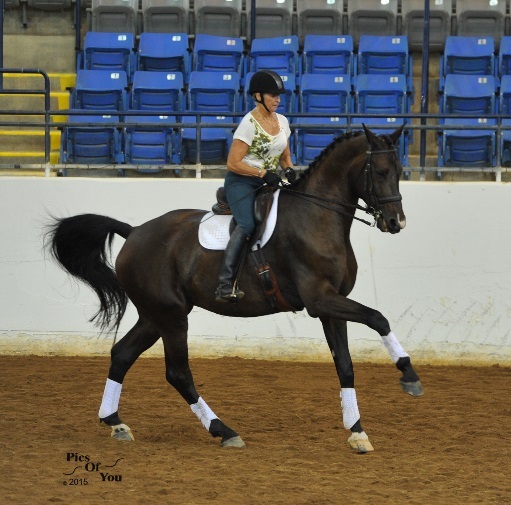 Langwost-Barlow and her 18.2 h, 2003 Oldenburg gelding, “Chesapeake,” set the first mark to beat with twenty six consecutive two-tempi changes. Following the impressive feat, Langwost-Barlow reflected on her TDF experience. After just a few, short minutes of discussing her European dream trip, it was clear how invaluable that opportunity was to her career. 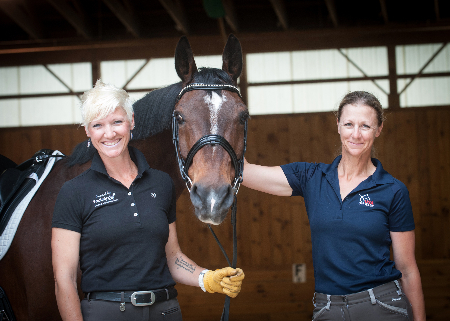 Langwost-Barlow was most impressed with the quality of training, teamwork, and respect for the sport found in European Dressage. It is worth noting the Langwost-Barlow team scored a jaw-dropping 66.500% in DAL’s Grand Prix feature. Langwost-Barlow broke “Chesapeake,” as well as her mare “Libertina,” who placed second in her division and third overall in DAL’s 2015 Prix St. George Challenge with a 68.026%. Another disciple of TDF was Langwost-Barlow’s late father, Craig Langwost, who the industry lost just a few months ago. Mr. Langwost, a longtime supporter of TDF and DAL, was no stranger in the barns and will be missed. In honor of her father, Langwost-Barlow has requested we donate to and support TDF.